Cake pops get a spooky makeover into Halloween ghouls with a simple four-ingredient recipe you can whip up on Halloween. 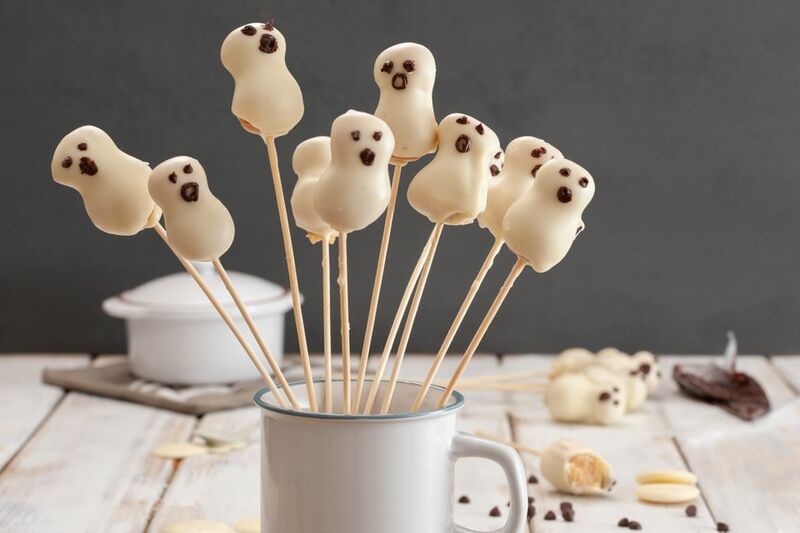 Tender bites of cake are shaped into ghosts, skewered on lollipop sticks, then dipped in vanilla candy coating for a fun Halloween version of the kid-friendly treat. The best part? You can mix and match whatever cake and frosting flavors your family loves—or even use store-bought versions of each to save time. Place the cake in a large bowl and crumble it roughly with your hands. Once it's in fine crumbs, add about 2/3 of the frosting and begin to mix it with your hands into the cake crumbs, working until the mixture is evenly moistened. You want the cake mixture to easily hold together when you press it into a ball, but still retain a little texture. If it seems as if the cake mixture is too dry, add more frosting until you're happy with the taste and texture. Using a cookie scoop or teaspoon, form the mixture into small balls. Roll the balls between your palms, then shape them into an elongated cylinder. Press your fingers in the middle of the cylinder to form an indentation. You're trying to create a shape that has a distinct head and body. Once all of the ghost shapes are formed, place them on the prepared baking sheet and freeze until firm, at least 1 hour. After the ghost cake pops have been frozen, remove them from the freezer. Melt the candy coating in the microwave and stir until completely smooth. Use a skewer to poke a hole in the bottom of a ghost, then dip the tip of a lollipop stick in the candy coating and press it into the hole. This will help anchor the stick into the cake pop. After all of the ghosts have been skewered, dip one fully into the candy coating until it's submerged. Take it out of the coating and gently tap the stick against the lip of the bowl so that excess coating drips off. Either hold it until the coating sets, place the wet ghost back on the baking sheet to set, or stick it in styrofoam to let it set upright. Once all of the ghosts are dipped, use a food-safe marker to draw faces on the ghosts. If you don't have these markers, you can melt chocolate chips and use a toothpick to give them faces, or put the melted chocolate in a plastic bag and use that to pipe on their eyes and mouths. Store ghost cake pops in an airtight container in the refrigerator for up to a week. For the best taste and texture, allow them to come to room temperature for about 20 minutes before serving.